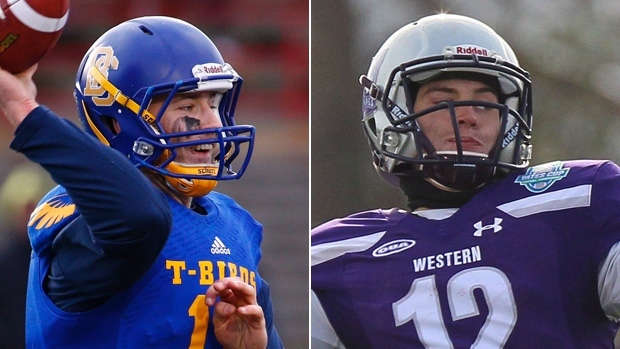 Four years after Brandon Bridge and Andrew Buckley were drafted in the CFL to play quarterback, there are two more intriguing names at the position among the group of prospects ahead of this year’s CFL Draft. Michael O’Conner and Chris Merchant both took part in the CFL Combine this weekend as they vie to cement their draft stock ahead of the May draft. CFL on TSN analyst Duane Forde said O’Connor has the pedigree of an American quarterback. Prior to his time with the UBC Thunderbirds in USports, O’Connor spent time with the Penn State Nittany Lions in the NCAA. TSN Football Insider Dave Naylor added former Toronto Argonauts quarterbacks coach Anthony Calvillo said O’Connor didn’t look out of place with the team as an invitee to training camp last season. Merchant on the other hand, reminded Forde of some recent Canadian quarterbacks drafted into the CFL.